I received Chanel Taboo in a swap. All opinions are my own honest thoughts. 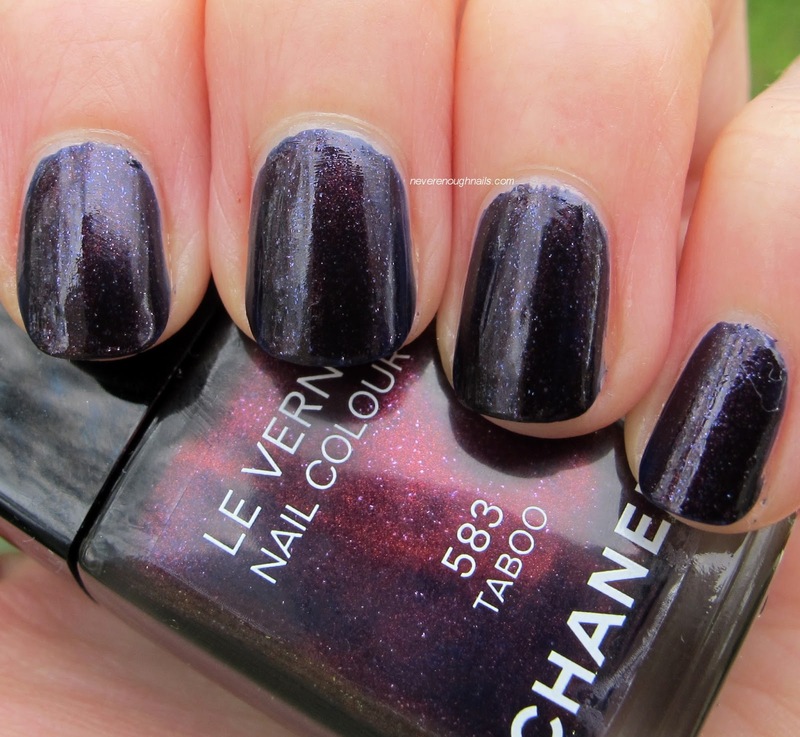 I have been lemming Chanel Taboo since the day it came out, but quite frankly, I didn't want to pay for it. In an excellent stroke of luck for me, I actually ended up swapping for this on Makeup Alley! I swapped away a Chanel face cleanser I wasn't even using, so it felt like getting Taboo for free! Taboo is ridiculously stunning in the bottle. It looks like a red-purple galaxy with silver stars floating throughout. 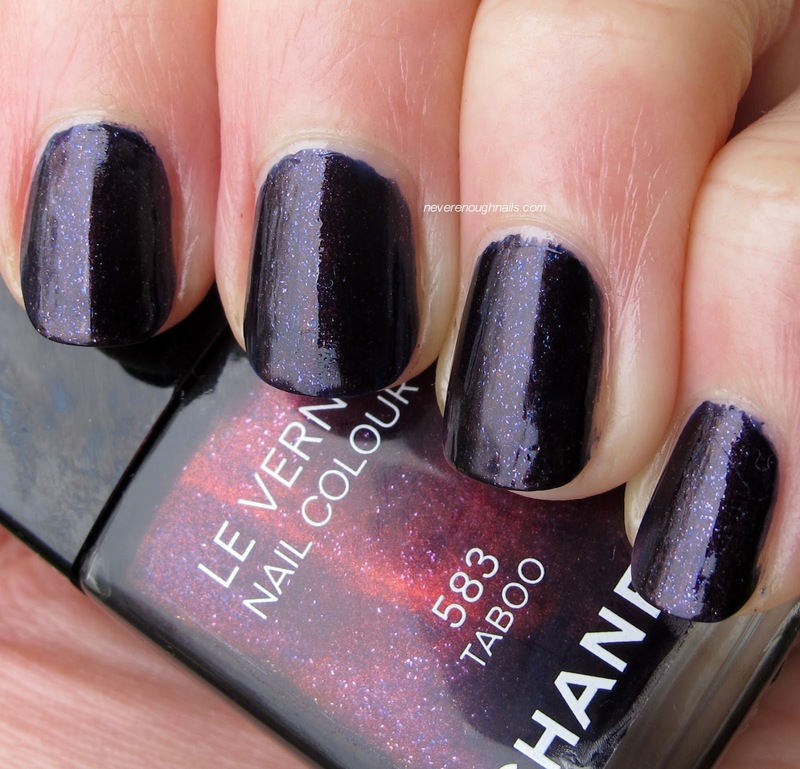 On my nails, however, it kind of looks like your average blue-toned vampy purple, albeit those pretty silver flecks dancing around. Now don't get me wrong, I really love Taboo. 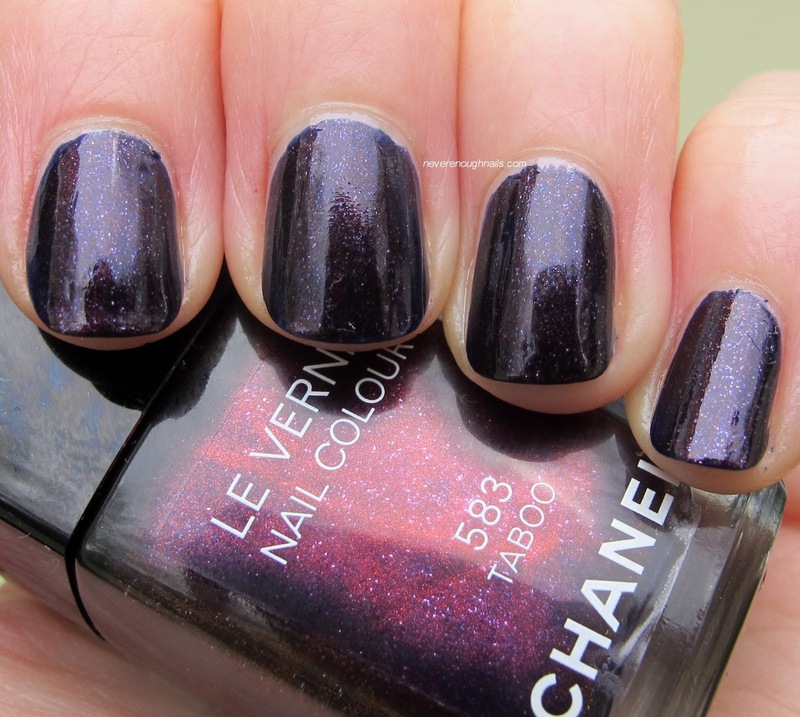 I am a huge sucker for vampy Chanel polishes. I think if I had paid actual money for this, I'd be a little bummed though. I do think the silver flecks make it different from other vampy purples we've seen in the past. One thing is for sure, application here was a breeze. I only needed two coats, and the formula was excellent. Just the right level of thickness and easy to apply. If you get Taboo, you do not need to fear bad application. So overall, I'm glad I got this in a swap. I will definitely keep it, but I'm not sure it's worth $27! Still, a lemming satisfied is a good feeling! I just have to get rid of my Chanel Azure lemming now, yikes! Taboo is still available on Chanel.com if you just can't get past your desire for it. I know it's only Thursday, but do you have any fun plans this weekend? I do... I'm going to look at kittens on Saturday!!!!! Some of you may remember that my kitty Marbles, my best friend for 17 years, passed away about a year ago. I still am so thankful for all of your support and kind words during that time. I now feel like I am finally ready for a new kitty and there are a bunch up for adoption from a local cat rescue project, so I am SO EXCITED for Saturday! Whenever I find the right kitten for me, you can expect about 3 billion pictures LOL! This is really pretty! And I can't wait to see the kitty photos!